The important thing to look for when choosing the size of your radiators is the wattage. However tall, wide or deep your radiators are, it’s the wattage which will determine how effectively your radiators will be able to heat your room. You can use our radiator calculator to work out what wattage will be required to heat your room efficiently. Then all you have to is find a radiator, or combination of radiators, that adds up to the required wattage. Because of their height, most vertical radiators give off a fairly high wattage so you may only need one to heat your room. However, if a single vertical radiator does not satisfy your required wattage, you should always supplement it with an additional radiator or heater. Under-specifying your heating will make it difficult for your radiators to heat your room adequately – and will force them to work less efficiently, inflating your heating bills. How are vertical electric radiators installed? Most vertical electric radiators are suitable for DIY installation – just like horizontal electric radiators. The radiators are provided with a fitting template, comprehensive instructions and all necessary fixtures and fittings, so you only need minimal DIY knowledge to fit your radiators safely on the wall. Then all you have to do is plug them into the nearest available socket. Alternatively, if you prefer a more discrete fitting with no visible wires, you can hire an electrician to hardwire the radiators into the wall. Are vertical electric radiators efficient? Vertical electric radiators are just as efficient as horizontal electric radiators. They use the same fast-acting, heat retentive electric heating elements and offer equally accurate heating control facilities. 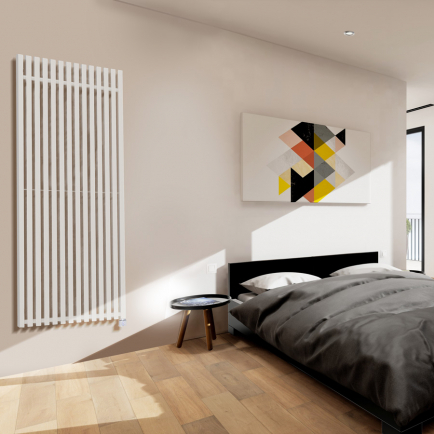 Save space in your property with a stylish alternative to conventional horizontal radiators. 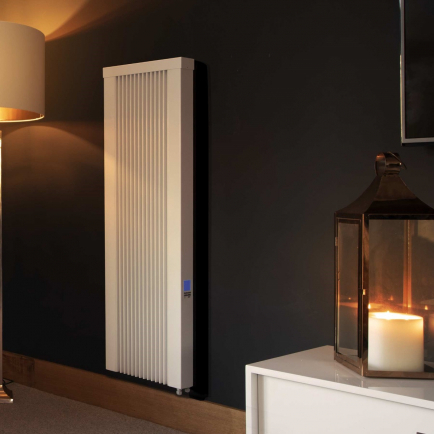 Vertical electric radiators make use of tall, thin wall spaces in rooms where space is at a premium – and keep you warm with energy efficient, fully controllable electric heating. 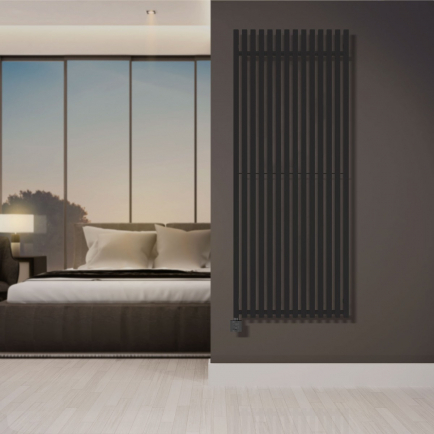 The Electrorad Aero-Flow Vertical Electric Radiator is easy to install wall mounted: all you have to do is screw the radiator to the wall and plug it into the nearest socket. It can even be mounted free-standing if purchased with a set of casters. The elegant fluted steel body is an effective choice in both modern and traditional interiors.